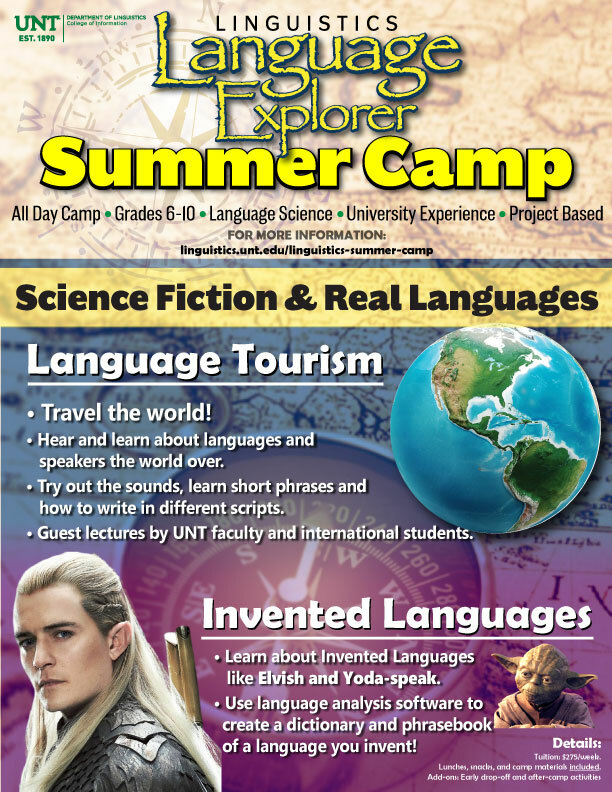 DENTON (UNT), Texas — Dozens of camps and programs* at the University of North Texas will educate and entertain children, teens and adult learners of nearly any age this summer. Participants will have the opportunity to explore and learn about the arts, the environment, sports, science, technology and more thanks to offerings such as “Snot Camp,” “Robots in the Wild” and “Explore STEM!” computer engineering camp for students with disabilities. For a full list of summer camps, visit https://calendar.unt.edu/event-calendar/categories/youth%20camps. JOURNALISTS/NEWS MEDIA: For press passes, photos from university photographers, locations and parking information, contact Monique.Bird@unt.edu or call 940-369-7782. If unavailable, call 940-565-2108 and ask for a member of the news team. *Participants interested in signing up should defer to the individual camp websites for registration, deadlines, costs and contact information. If any discrepancies exist between this document and camp websites, please defer to the camp organizers. Mulberry Street Studio Art Camp – A unique children’s camp that offers an immersive art experience at the UNT College of Visual Arts and Design. The studio is created with children in mind where students and instructors experiment, cultivate curiosity and explore a variety of art materials and processes. The session will culminate in a student exhibition utilizing the many display areas of the new art building. Music Camps – The UNT College of Music is opening its doors to music students of all ages and experiences. Elementary school students, college graduates, students and professionals, those who want to learn more, fine tune their musical skills or who build on their knowledge of music instruction. Where: All music camps occur on the UNT campus in Denton, unless otherwise noted. June 9 - 13: The Marching Percussion Workshop trains high school percussionists in the tradition of the world-renowned North Texas Drumline. Designed for high school students. June 23 – 28: UNT Vocal Jazz Summer Workshop – Musicians aged 14 to 99 come together for one intense week, participants are involved in every aspect of vocal jazz, from solo and ensemble performance to improvisation, pedagogy, songwriting and jazz theory. Camp concludes with a jam session to try out improvisation skills and a Friday night concert. A songwriting class is offered to those with some proficiency in music theory. Theatre Camps – Students can get experience in improvisation, characterization, pantomiming and other must-know theatre techniques through two different theatre camps offered by UNT. Campers will also enjoy rehearsing fairytale scenes with costumes, props and sets. Short Story Exploration – Participants will learn about the major genres by exploring a new kind of short story each day including horror, detective and science fiction. This camp is perfect for readers or aspiring writers who want to learn more about what makes great stories great. Live and Learn Summer Program through UNT WISE (Workplace Inclusion & Sustainable Employment) – A two-week summer program for young adults with disabilities, ages 16-22, interested in vocational planning for their future. Whether their interests lie in entry-level, skilled or professional occupations, this program opens the door to the realities of the adult world of work. The program teaches participants independent living skills, social and recreational skills, and pre-vocational/vocational skills. C5 Youth Foundation of Texas Summer Camp – Texas high schoolers come to campus for an “Amazing Race” type challenge where they’ll get to experience college life. The UNT stop is part of a weeks-long road trip in which juniors from around the state visit various colleges. Many of the students have done well in school but will be the first in their families to go to college, live in a single-parent household or come from low income families in under-resourced communities. College WISE program through UNT WISE (Workplace Inclusion & Sustainable Employment) – A one-week program for young adults with disabilities, ages 16-22, interested in pursuing a college degree. An overview of the expectations and demands of college life are explored. Participants engage in a variety of activities aimed at demonstrating skills necessary to be successful in higher education, including independent living, social and recreational skills. What: The STARTALK program – A free intensive beginning Russian language-immersion course. Funded by the National Security Agency to encourage the teaching of critical-need languages: Arabic, Chinese, Dari, Hindi, Korean, Persian, Portuguese, Russian, Swahili, Turkish and Urdu. The non-residential four-week course at UNT, “Welcome to My World,” includes 120 instructional hours in beginning Russian. Students have an opportunity to take a free placement exam at the end of the course and earn three college credit hours. What: American Culture and Communication Camp – Offers middle and high schooler who are studying English as a second language the opportunity to study and practice English in a university setting through language immersion, social interaction and experiential learning. Participants will practice and improve core English skills as they learn about American culture and communication. Morning classes focus on core English skills including grammar, listening, reading, speaking and pronunciation, and writing. Afternoon classes focus on American culture and oral communication, and on project-based English learning through games, sports, art, film, performance, and presentations. Language Explorer: Real and Sci-Fi Languages – Become a language tourist and experience speakers the world over. Participants get to try out the sounds, learn short phrases, and how to write different scripts. Learn about invented languages like Elvish and Yoda-speak, then use language analysis software to create a dictionary and phrasebook of a language. Language Explorer: Dialects and Fingerprints – Travel the nation by hearing and learning about dialects of American English. Do linguistic fieldwork on language dialects and how people feel about Texas speech. 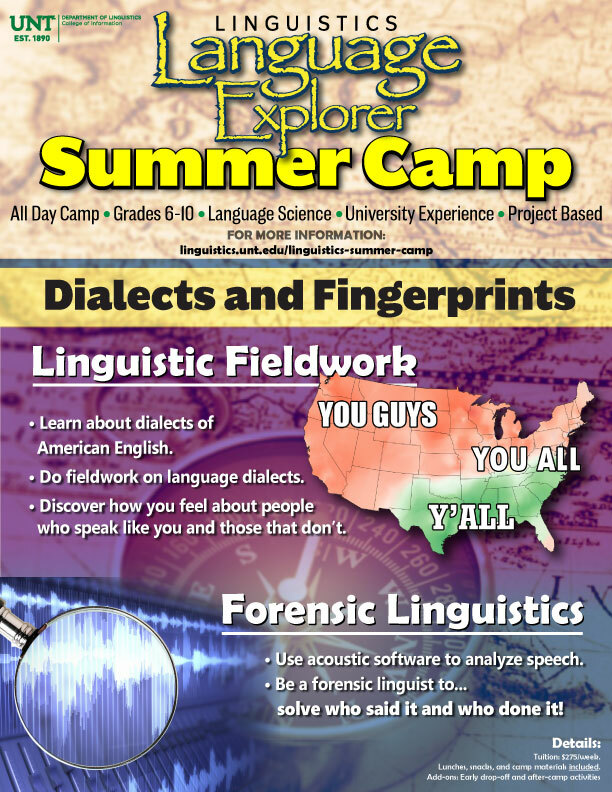 Discover what language can reveal about a speaker, use acoustic software to analyze speech, and become a forensic linguist to solve who said it. The UNT JAMP Camp helps highly qualified, yet economically disadvantaged, Texas students pursue a degree in medicine. The camp prepares incoming pre-med students with an introduction to rigorous science and math, as well as exposure to aspects of medical school curriculum that will help them apply for the UNT Joint Admission Medical Program. The Elm Fork Education Center offers a number of camps for children in 2nd through 8th grade. Camps running June 10 – 14. Simply Machines. Grades 3-5. Rediscover the technology that allowed ancient cultures to build pyramids, castles, ships that could cross oceans and the weapons used to destroy them all. Discover how modern engineers use the lever, wheel and inclined plane to build more efficient, faster and complex machines. Camps running June 17 – 21. Chem2Kids. Grades 3-5. Between kick the can ice cream to making our own bouncing balls, this camp will explore chemistry in a fun light! Campers will dive into the world of chemistry with fun, hands-on activities, experiments, and demonstrations. Game-On. Grades 3-5. Look at the secret science behind athlete’s success. Campers will explore the human body, health, laws of physics, and the "hows" & "whys" of sporting equipment. Participants will walk away looking at sports in a whole new light. AstroKid Academy. Grades 3-5. Join a week of astronaut training. Campers will explore the universe, learn about the physical and mental preparation for space exploration and the science of launching a NASA shuttle into space. Campers will also work in teams to build and launch their own rocket! It's Snot Camp - It's the study of all things gross. Snot, farts and more… If you were told not to discuss it at the dinner table we will be exploring it in camp. Not for the queasy or easily offended. Camps running July 8 – 12. Innovention. Grades 2-4. An introduction to engineering! Campers will be brainstorming, designing, and building a new game or toy, or improving an existing product. In the course of the week, students will also investigate and discover new ways of accomplishing tasks, such as Squish Circuits. Camps running July 15 – 19. Just Beneath the Surface. Grades 3-5. Have you ever wondered what makes a pond, a pond? Campers join us in discovering what's beneath the surface by examining the water itself and exploring insects, tadpoles, fish, microscopic organisms, and more. The Lewisville Lake Environmental Learning Area offers several summer programs for children ages 7 to 12. June 10 – 14: Outdoor Adventure Summer Camp – Play all day in our 2,600-acre nature preserve during our Outdoor Adventure Summer Camp. Hike, explore the log house, catch insects, learn to kayak and more. June 17 – 21: Half-Day Outdoor Adventure Summer Camp – Beat the heat with a half-day morning camp Monday to Friday from 8 am-1 pm. Hike, explore the log house and much more. June 24 – 28: Robots in the Wild – Full STEAM (Science, Technology, Engineering, Art and Mathematics) ahead during our outdoor camp. Children will enjoy traditional LLELA activities like hiking, insect netting and pond exploration, but also robotics and indoor STEAM activities during the hot part of the day. UNT head coaches and staff run their own sports camps throughout the year. The camps are a great way for young athletes to improve their skills, learn more about the sport and interact with North Texas coaches and players. Camps are available for football, men’s and women’s basketball, men’s golf, soccer, swimming and diving, tennis, track and field, and volleyball. Research Experiences for Undergraduates in Vehicular Edge Computing and Security – A 10-week, National Science Foundation funded research program designed to increase the number of women, minorities and students from underrepresented populations in the area of autonomous vehicles, edge computing and secure connected systems. The Aviation Career Education Academy gives high schoolers the chance to explore aviation and aerospace careers. Students practice with flight simulators, learn about the mechanics of flight, take field trips to nearby aviation companies and airports and even co-pilot a small airplane with an FAA-certified flight instructor. MEDIA: Limited opportunities are available for photographers capture video, photos and interviews while students are in flight. Please contact Monique.Bird@unt.edu by May 31 and she will email the documents which need to be signed by your news organization. Future Engineers Summer Camps – Young scientists and inventors can explore solar and wind energy, learn 3D printing, try out aluminum sandcasting, test injection molding and build a solar car, among other activities. The camp concludes on Friday with a design day and competition. RoboCamp introduces students to hardware platforms and software development tools. Students will assemble a multi-purpose robot from a kit and then learn to interact with and control various sensors, motors and related components. What: AppCamp teaches students about Mobile App development for Android devices using AppInventor – a tool developed by Google and supported by MIT. Students will build a number of apps using various sensor technologies found in most smartphones and tablets. Summer Mathematics Institute – A fast-paced, intensive program for mathematically talented students. Students can master one year of high school math in less than one month. Classes are 6 hours a day + 3 hours on Saturdays. Teaches Algebra I, Geometry, Algebra II and Precalculus. Animation and Game Camp teaches computer science-related topics with an emphasis on design and programming skills to be applied in virtual world environments. Students will build a virtual world environment that they can access at home and continue to expand. Sports Analytics and Management Camp – Participants will learn how to apply data analytics to evaluate player performance, recommend coaching decisions and run a sports business. Topics will include statistical analysis, wearable data-collection technologies, data-driven decision making and how those topics are changing the way sports enterprises are run. Explore STEM! Computer Engineering – This program is designed for students with disabilities who have little to no previous exposure to computer engineering and who have an interest in basic programming and computer hardware. Activities will include basic programming concepts, rover programing, interactions with smart lights, buttons, sensors and other Internet of Things (IoT) devices and printed circuit board (PCB) soldering. Explore STEM! Computer Science – Students with visual impairments and other disabilities will have the chance to explore basic concepts of coding, to learn about website design and to create and test computer hardware and programs. This program is for students with little to no previous experience but have an interest in programming and coding.